Joseph Henry (1797-1878), a physicist and the first Secretary of the Smithsonian, was a pioneer in the fields of electricity and electromagnetism, and stimulated work in anthropology, aeronautics, meteorology, the telegraph and the telephone. View images from Henry's research career, from his personal Record of Experiments and images of apparatus he pioneered. Joseph Henry's Albany magnet. Henry, who would later become the first Secretary of the Smithsonian Institution, was the first to construct an electromagnet formed by tightly wrapping multiple coils of an insulated conducting wire around an iron bar, c. 1820s, by Unknown, black and white negative, courtesy of Smithsonian Institution Archives, Accession 11-006, MAH-39040 or 39,040. 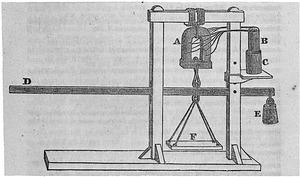 Joseph Henry's Albany magnet with its battery and apparatus for measuring its strength. Henry, who would later become the first Secretary of the Smithsonian Institution, was the first to construct an electromagnet formed by tightly wrapping multiple coils of an insulated conducting wire around an iron bar, 1831, by Unknown, negative, courtesy of Smithsonian Institution Archives, Accession 11-006, MAH-46797F or 46,797-F.
Joseph Henry's Yale magnet, showing windings and conductors for connection to the battery. 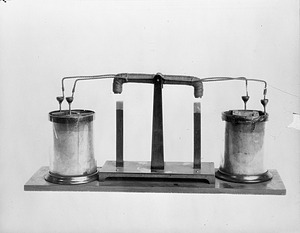 Shortly after completing an article on his electromagnet for Benjamin Silliman's American Journal of Science, Joseph Henry, who would later become the first Secretary of the Smithsonian Institution, began making a large electromagnet for Silliman to demonstrate to his students at Yale c. 1830s. The 82.5 -pound magnet proved capable of supporting more than 2,000 pounds, 1974, by Alfred Harrell, negative, courtesy of Smithsonian Institution Archives, Accesssion 11-009, 74-4407_cn or 13,346. Joseph Henry's oscillating electromagnet motor. The motor was a simple device whose moving part was a straight electromagnet rocking on a horizontal axis. Henry, who would later become the first Secretary of the Smithsonian Institution, believed his machine was important as the first demonstration of continuous motion produced by magnetic attraction and repulsion, c. 1830s, by Joseph Henry, negative, courtesy of Smithsonian Institution Archives, Accession 11-006, MAH-46797E or 46,797-E.
Reconstruction of Joseph Henry's original oscillating electromagnet motor, which he had first constructed in the 1830s. The motor was a simple device whose moving part was a straight electromagnet rocking on a horizontal axis. Henry, who would later become the first Secretary of the Smithsonian Institution, believed his machine was important as the first demonstration of continuous motion produced by magnetic attraction and repulsion, c. 1830s, by Unknown, negative, courtesy of Smithsonian Institution Archives, Accession 11-006, MAH-24976A or 24,976-A. Smithsonian replica of Joseph Henry's Princeton University oscillating electromagnet motor, which he had constructed while teaching there c. 1830s. The motor was a simple device whose moving part was a straight electromagnet rocking on a horizontal axis. Henry, who would later become the first Secretary of the Smithsonian Insitution, believed his machine was important as the first demonstration of continuous motion produced by magnetic attraction and repulsion, c. 1830s, by Unknown, glass negative, courtesy of Smithsonian Institution Archives, Accesssion 11-006, MAH-29682 or 29,682. During his years at Albany Academy and the College of New Jersey (now Princeton University), Joseph Henry (1797-1878), first Secretary of the Smithsonian Institution from 1846 to 1878, designed the most powerful electromagnets of his day. 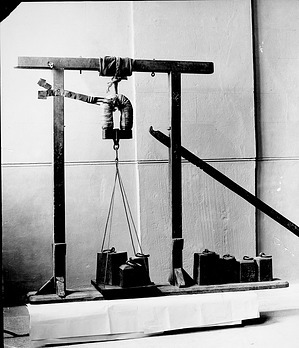 Henry constructed this powerful electromagnet for Benjamin Silliman of Yale University to exhibit before his students. It is now in the National Museum of American History. 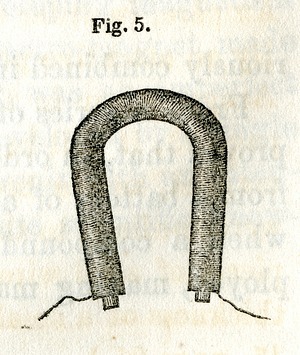 Sketch of Joseph Henry's magnet. 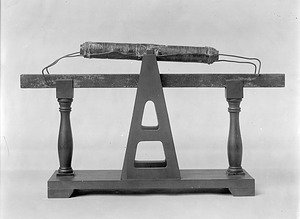 Henry, first Secretary of the Smithsonian Institution, was the first to construct an electromagnet formed by tightly wrapping multiple coils of an insulated conducting wire around an iron bar. This technique improved upon the earlier work of William Sturgeon, increasing the magnetic power, 1857, by Joseph Henry, drawing, courtesy of Smithsonian Instution Archives, Annual Report of the Board of Regents of the Smithsonian Institution Showing the Operations, Expenditures, and Condition of the Institution for the Year 1857, (Washington, DC: William A. Harris, Printer, 1858), 101, SIA2012-7649. 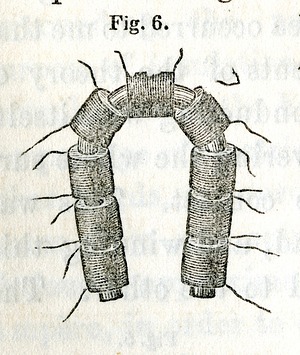 Sketch of Joseph Henry's more powerful magnet. 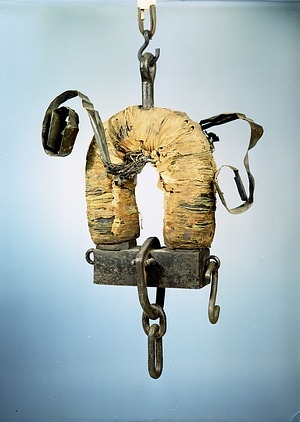 Henry, first Secretary of the Smithsonian Institution, was the first to construct an electromagnet formed by tightly wrapping multiple coils of an insulated conducting wire around an iron bar. This technique improved upon the earlier work of William Sturgeon, increasing the magnetic power, 1857, by Joseph Henry, drawing, courtesy of Smithsonian Institution Archives, Annual Report of the Board of Regents of the Smithsonian Institution Showing the Operations, Expenditures, and Condition of the Institution for the Year 1857, (Washington, DC: William A. Harris, Printer, 1858), 102, SIA2012-7650. Sketch of "telegraph" Joseph Henry showed his classes at the Albany Academy. 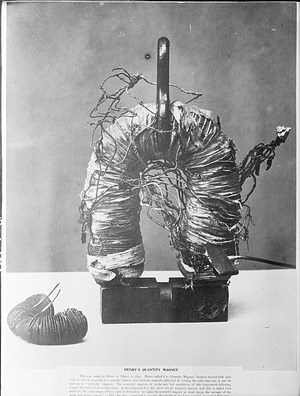 Henry, first Secretary of the Smithsonian Institution, was the first to construct an electromagnet formed by tightly wrapping multiple coils of an insulated conducting wire around an iron bar. He applied this new technology to create the telegraph apparatus. 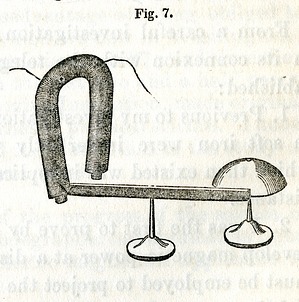 Henry sent an electrical signal through a length of wire to stimulate a horseshoe magnet, which then attracted a steel bar that struck a bell when moved, 1857, by Joseph Henry, drawing, courtesy of Smithsonian Institution Archives, Annual Report of the Board of Regents of the Smithsonian Institution Showing the Operations, Expenditures, and Condition of the Institution for the Year 1857, (Washington, DC: William A. Harris, Printer, 1858), 105, SIA2012-7651. Joseph Henry's Drawing of a Lightning Rod Attached to a House from his letter to to James Rodney, March 25, 1846, document, courtesy of Smithsonian Institution Archives, Record Unit 7001, Box 8, Folder: 19 - January-March 1846, SIA2012-2885a.